This chic hotel is located in southern Pattaya just by Phratamnak Beach. The rooms are very well appointed and have sizeable balconies or terraces. The restaurants offer excellent views of the bay. 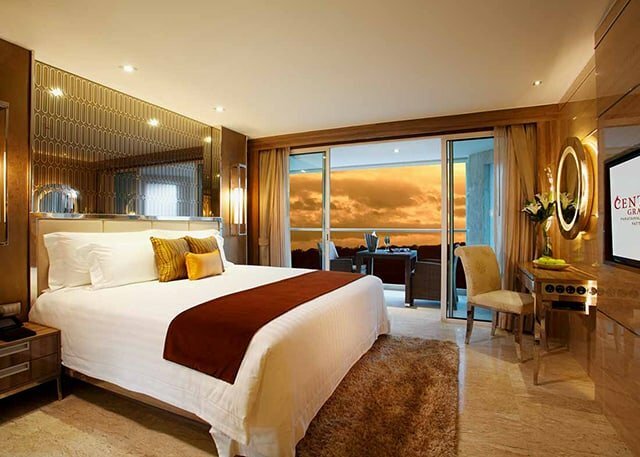 These rooms are sleek and elegant and provide you with everything you need on holiday. With a beautiful king size bed and en-suite bathroom which is finished to a very high standard your stay is sure to feel comfortable and luxurious. These spacious suites provide you with a very comfortable stay. There is plenty of living space for you to enjoy and your nights will be very peaceful thanks to the beautiful king size bed. The bathroom includes a large shower and bathtub. For families with children, it is always nice to be close together which is why these suites have been designed especially for families due to the separate children’s bedroom which is equipped with bunk beds. The master bedroom still has that chic elegant feel everyone wants when on holiday. There is plenty of living space for you to enjoy and the bathroom is finished to a very high standard. Enjoy the private balcony where you can watch the sunset every evening. These suites are the epitome of luxury. With exquisite furnishings you are sure to have an amazing stay. The bedroom is separated from the living area to give you an intimate stay. There is also a separate children’s bedroom which has bunk beds. Outdoors you will have a private balcony with a table a chairs – perfect for al fresco dining. This rooftop restaurant is perfect if you are looking for a delicious Italian-inspired meal. With its laid-back ambience and ocean views, you are sure to have a relaxing dining experience. This all-day dining restaurant serves a delicious Thai-inspired menu. The large shark tank in the restaurant makes your dining experience exciting. This restaurant is the perfect place to grab a morning coffee and a delicious fresh pastry. If you prefer to eat in the comfort of your own room, then you can! Order off the a la carte menu and dine on your private balcony. The spa is a refuge for the senses. Head to the spa if you want the ultimate relaxation experience. They offer a lovely selection of treatments including massages, facials and aromatherapy treatments.